Since the emergence of online writing courses in college and university institutions, teachers and tutors have struggled to effectively engage and provide constructive feedback to their students in online learning environments. A great challenge for many new teachers and tutors is learning how to communicate with their students, facilitating and cultivating an interactive environment in which teacher-student or tutor-student feedback results in the student developing strategies for their writing. One of the main obstacles is the myth that traditional face-to-face teaching instruction is transferable to online writing instruction. However, writing teachers and tutors need to shift from traditional face-to-face pedagogical practices to a more inclusive dynamic interaction among the teacher-student conferencing, which embraces the digital technologies available in online learning environments (Warnock, 2009, p. xxi; Vaughan, 2010, p. 61). 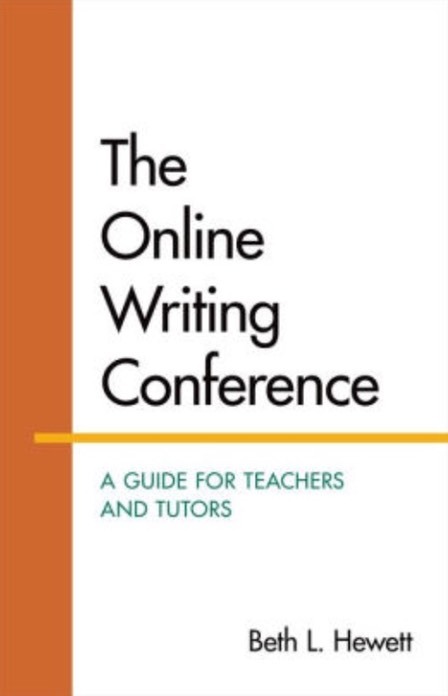 The book by Beth L. Hewett (2015), titled “The Online Writing Conference: A Guide for Teachers and Tutors,” presents an instructive pedagogical framework that guides writing teachers and tutors on how to actively engage and provide effective one-to-one writing conferences with their students in online learning environments. Hewett (2015) advocated conference-based teaching that emphasized “modeling writing and revision; consistently using targeted, problem-centered lessons that require student action; and listing next steps that explicitly guide students toward future drafts” (p. 6). The author also argued that one-to-one online conferencing helps encourage “relationship building, problem solving, and writing formation” (p. 19). Hewett’s book provides a pedagogical framework to online writing instruction (OWI) that offers a "best practices" approach to one-to-one teacher-student conferencing. In each chapter, Hewett scaffolded the theory of conference-based teaching for novice online writing teachers and tutors. She began the conversation by discussing the challenges of online teaching and conferencing, juxtaposing the comfortability of traditional face-to-face conferencing with the challenges of online asynchronous writing conferences. This dialogue builds with the description of problem-centered teaching and the meaning of online conferencing. Each chapter layers the framework for pedagogical practices of one-to-one asynchronous text-based conferencing that encompasses establishing a trusting relationship with the student; providing practical online writing instruction that focuses on vocabulary, tone, and problem-centered instruction; the importance of modeling in writing strategies; and the value of interactive rubrics and journals, as well as student and instructor audits to assess writing conference practices.